An exploration of the information which can be unearthed from the fragile bits of paper associated with the frame. This article was originally given as a paper at the Melbourne symposium, Frame: Concept, History & Conservation, held under the auspices of the AICCM at the National Gallery of Victoria, 24th-26th August 2016. Several years ago, one of the major treasures belonging to the National Gallery of Victoria needed to be conserved. This is Poussin’s Crossing of the Red Sea, painted around 1634, and subject over the centuries since not only to the wear and tear of time, but to changes caused by retouching of the painting in earlier conservation treatments. Much of this had been done in the National Gallery, London, in 1960, when the sky, clouds and landscape – which had sustained most damage in a 1947 cleaning – were restored to a more consistent surface, but which were not now necessarily as Poussin had painted them. This was because there had been at the time nothing exact to refer to from which to gain knowledge of the lost detail. 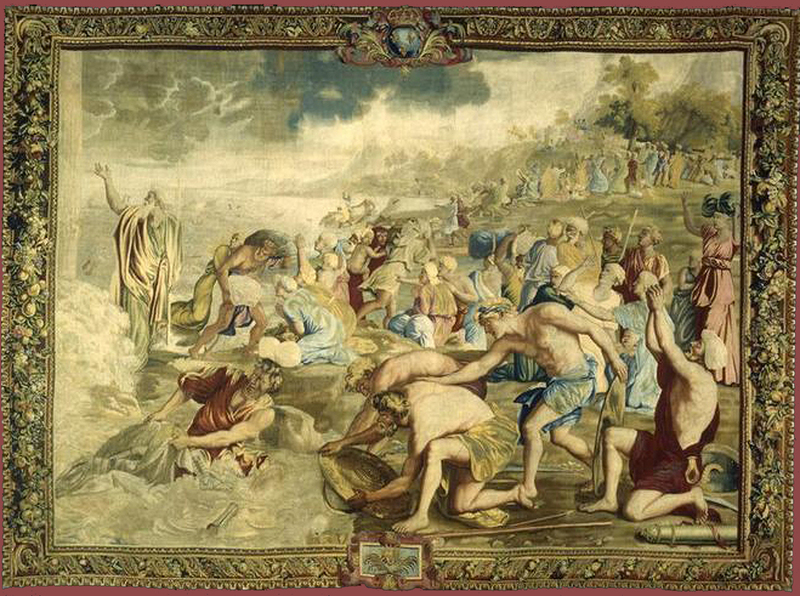 The crossing of the Red Sea had been engraved and also reproduced as a tapestry – in both of which the design was reversed – but neither of these appeared to be identical facsimiles of the painting in its uncleaned state. The image used for the tapestry had also been cropped at the top and on the proper left, so that several figures and parts of the sky did not appear in it. Coincidentally, just when the Poussin was being assessed for restoration, a copy of it suddenly re-emerged into public view – a copy which could supply a more faithful record of the original composition, enabling the areas which had been worn and repainted to be returned to the artist’s original conception, and the tonal relationships to be readjusted. This painting, attributed to Louis XIV’s first painter, Charles Le Brun, had been known of but had apparently disappeared in the late 18th century. Its reappearance was fortuitous, and its recognition depended partly on the information given by its frame. In 2008 a lawyer in California catalyzed the research into this work. He had two clients who had inherited from their parents an oil painting, bought locally in San Francisco in the 1960s, but for which all the paperwork had been lost. 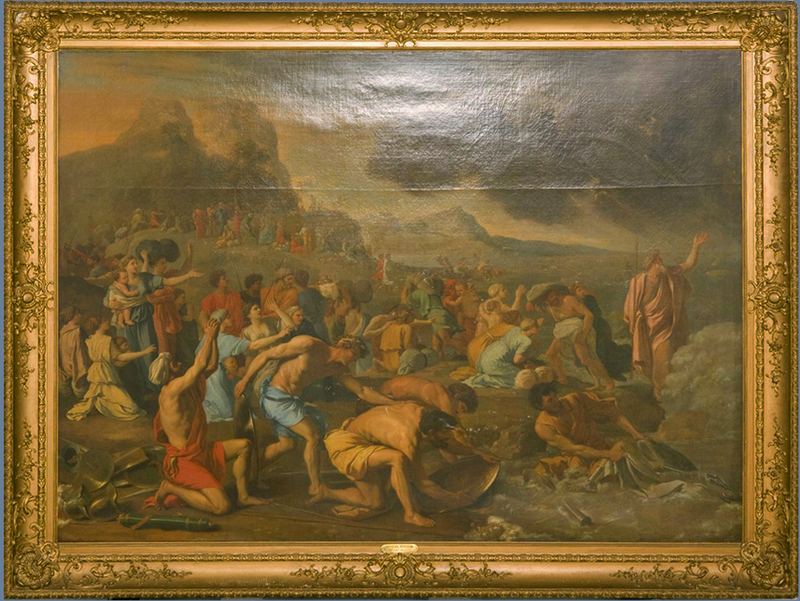 The title plate on the bottom of the frame attributed it to Nicolas Poussin, but since he had only painted one version of this subject, The crossing of the Red Sea, and that had been in Melbourne since 1948, the owners wanted to find out whose work it actually was, in order to establish what should happen to it. 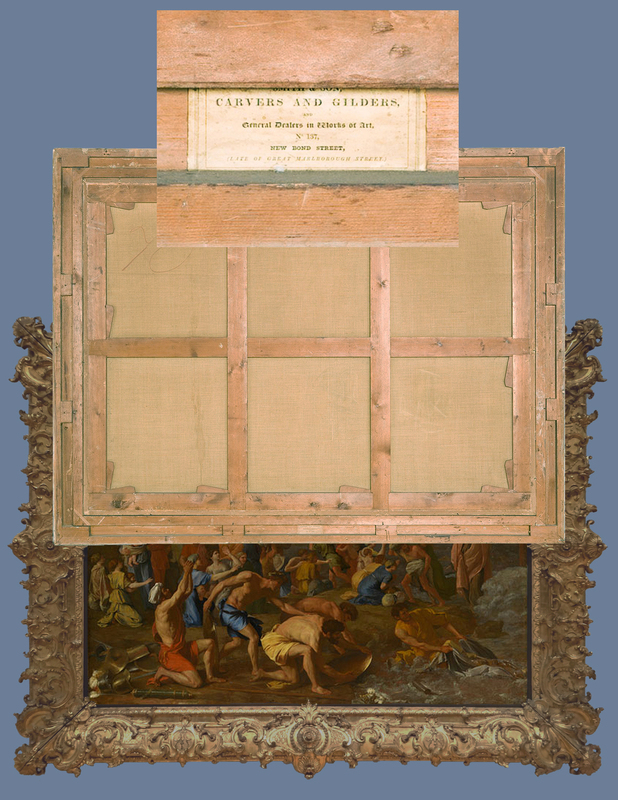 They had discovered that a copy of Poussin’s original painting had been sold in England in 1773, attributed to Charles Le Brun; apart from that the only other information they had was the framemaker’s label on the back of the frame. The label established the presence of the painting in London just after the sale, and will be described shortly. The evidence of the sale itself was interesting, as it introduced a colourful character into the story – one of several associated with the picture. 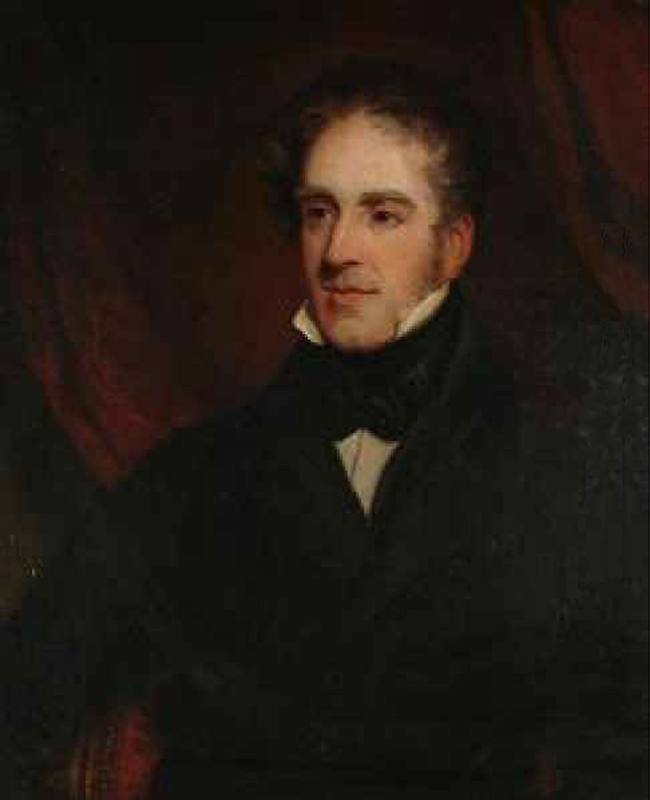 This was the Robert Strange whose ‘capital and elegant’ collection is advertized on the sale catalogue – a collection which, by any standards, appears to have included many important Old Masters. The front page mentions, in its optimistic 18th century way, Leonardo, Ludovico Carracci, Veronese, Carravaggio and Guercino, as well as Poussin and Claude. 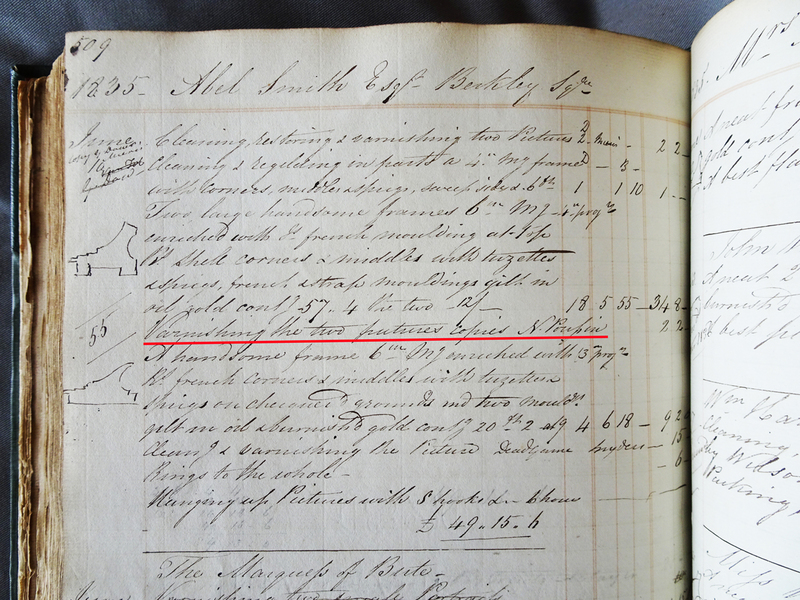 From hand-written annotations in the back of the catalogue, it appears that both paintings were sold to a Mr Parsons, for £67.11 shillings and £64. 1 shilling respectively. 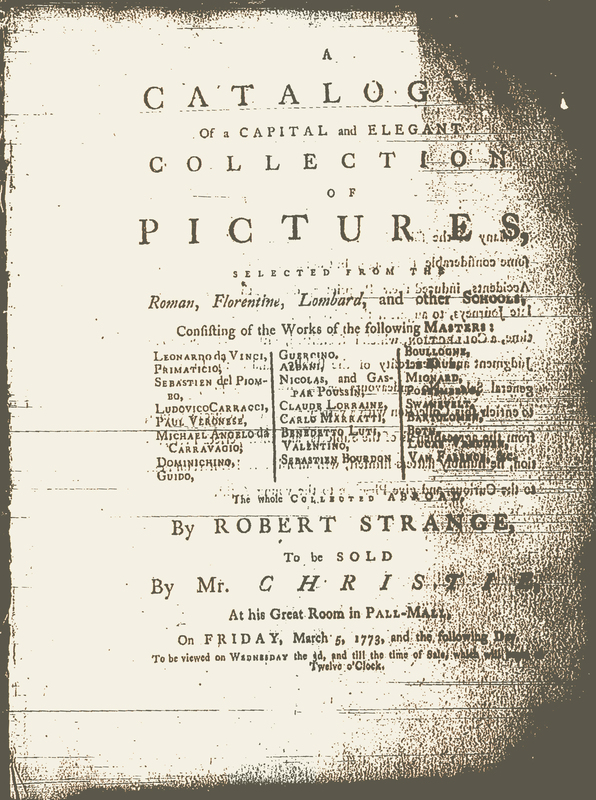 Robert Strange, who had included the two paintings by Le Brun in his sale, was born in 1721, a Scottish artist, engraver, picture collector and dealer. He had fought on the Jacobite side against George II, the Hanoverian king of Great Britain, in the rebellion of 1745, but ended by being knighted 42 years later by his son, George III. After the uprising, he carried Bonnie Prince Charlie’s seal to the exiled Jacobites in France, where he remained, studying drawing, anatomy and engraving. He lived in France and Italy for extended periods, acquiring a large and varied collection of paintings, most of which he had bought in order to engrave them and sell the prints. 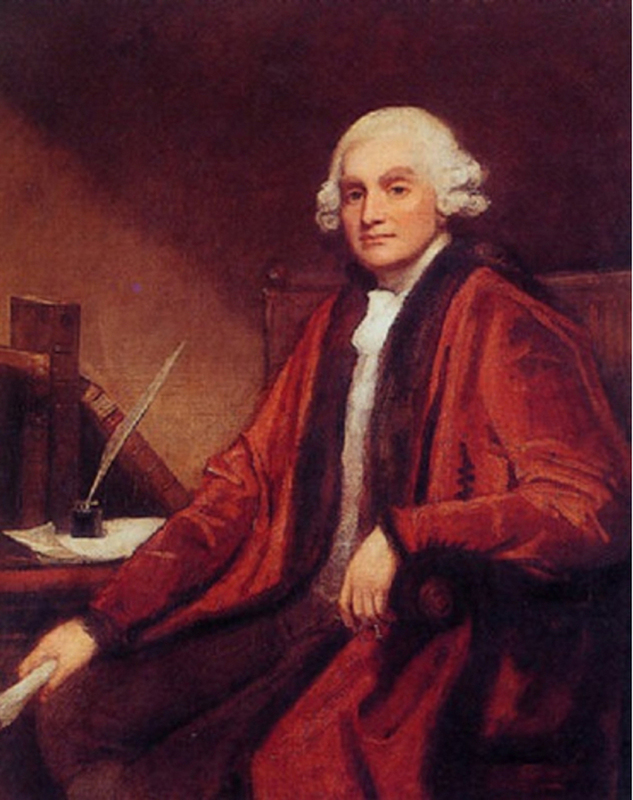 In 1769 he published a catalogue of his collection, with a title page explaining his credentials as a connoisseur: he was a member of the academies of art in Paris, Florence, Rome and Bologna, as well as Professor of the Royal Academy of Parma, and a Director of the Royal Society of Artists of Great Britain. The catalogue includes works by Annibale Carracci, Correggio, Guido Reni, Veronese, Poussin (four paintings), Raphael, Rembrandt and Rubens; it also has Leonardo’s Christ disputing with the doctors (probably the painting in the National Gallery, London, now ascribed to Luini). In 1771 he sold 153 of his paintings, making well over £6,000, and in the 1773 sale which included the Le Brun and its pendant he sold 115 more – amongst them a Poussin and another Leonardo. Although the earlier Leonardo eventually turned out to be a Luini, Strange was obviously enough of a connoisseur to achieve great recognition amongst his peers for his taste; moreover, he had an especially close acquaintance with the paintings which passed through his hands, since he was engraving them to sell. 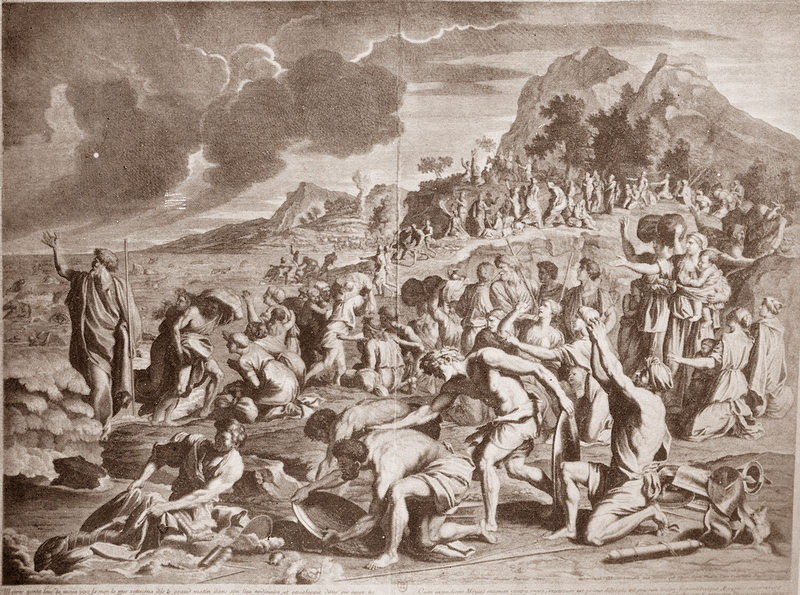 For these reasons it is particularly noteworthy that in the 1773 sale catalogue he did not claim that The crossing of the Red Sea and The adoration of the golden calf were copies by Poussin himself, which he easily might have done, but that both were by Charles Le Brun; this makes it more likely that he may have been aware of some provenance or attribution to Le Brun. He also notes the absence in the copy, of the pillar of fire in Poussin’s painting. The original pair of Poussins had been commissioned in Rome in 1632 by Amedeo dal Pozzo, and were hanging in his palazzo in Turin by 1634. Charles Le Brun only arrived in Rome in 1642, leaving in 1646, and Amedeo dal Pozzo died in 1644, so Le Brun would either have had to journey to Turin to make copies, or have had access to the paintings after Amedeo’s death. By 1685 both paintings were in France, leaving another window of about five years at the end of Le Brun’s life when he might perhaps have copied them. There was, then, enough of a foundation to indicate that this work and its lost pendant might be by Charles Le Brun, and that they had been recognized or even proved to be his work when Robert Strange acquired them, either in France or in Italy. The lawyer retained by the owners of the painting wished to know whether this information could be used to find out anything more about the painting. At that point Jacob Simon, the chief curator of the National Portrait Gallery, London, was working on the great Directory of British Framemakers on the NPG website. The Californian lawyer and his clients had discovered the entry for Smith in this directory, and had found there the dates when Smith was at the London addresses on the label – at Great Marlborough Street until 1828, and at 137 New Bond Street from 1829-1876. This meant that the label must date from just after the move from one address to the other, and therefore that the frame must have been made in 1829 or the early 1830s. The man behind the framemaker’s label is as interesting as Robert Strange. John Smith was born in 1781, and – like Strange – was apprenticed as a teenager: in this case to a carver and gilder in London. 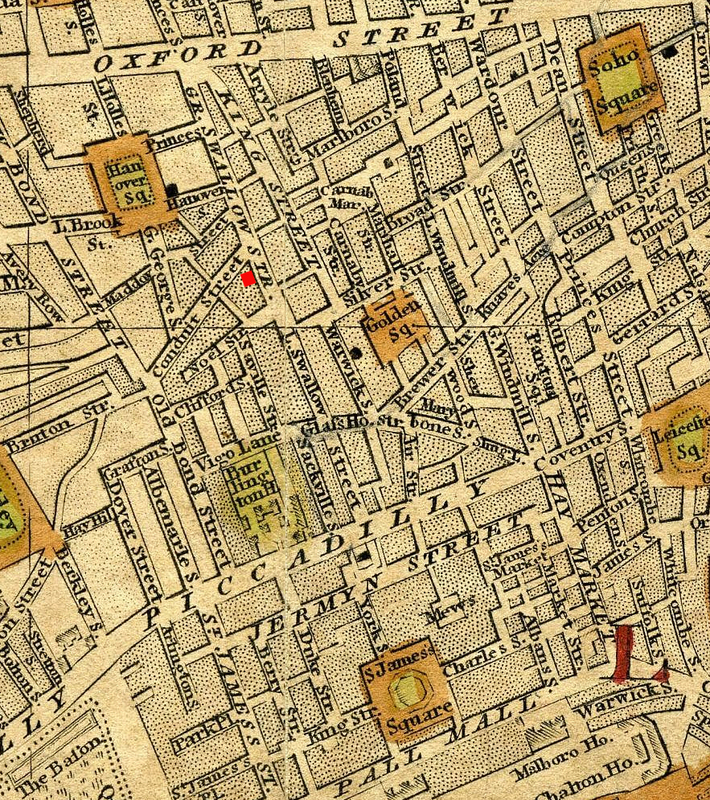 He set up in business on his own account in 1801 when he was only 20, with premises in Swallow Street, a long street which used to run from Piccadilly north to Oxford Street, but which has since had Regent Street built over the top of most of it. Then, however, it was a narrow but busy thoroughfare, and John Smith must have been well-positioned for passing trade. He produced both picture and looking-glass frames, and seems to have been a very hard worker; in 1810 he managed to attract royal notice, selling a frame to the Prince Regent, later George IV, for which there is an invoice in the Royal Archives at Windsor Castle. By 1812 – at the age of 31 – he had been appointed George III’s picture framemaker, and he held the same position for George IV from 1820, having continued to work for him whilst he was still the Prince Regent. 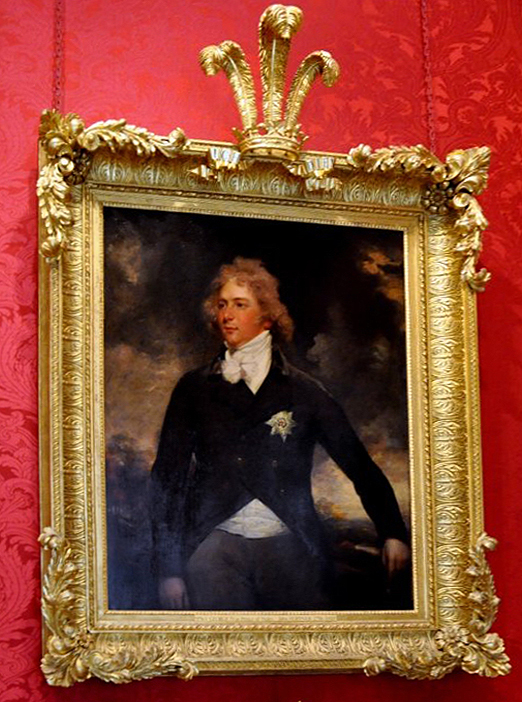 The frame on Hoppner’s portrait of the prince shown here is characteristic of Regency patterns in general, of the heavy frames promoted by Thomas Lawrence, painter to the King, and of John Smith’s style of picture framing. It cost £56. 5 shillings, including the Prince of Wales’s feathers on the crest (see entry for John Smith, NPG website). We know a great deal about Smith and the framing work he undertook, because, as well as many of his letters, his Day Books have most unusually survived, and are in the National Art Library at the V & A in London. Their pages are full, right from the beginning, of dukes, duchesses, marquesses and earls – amongst whom, coincidentally, the Earl Radnor appears: the owner of the original paintings by Poussin of the Adoration of the golden calf and Crossing the Red Sea. 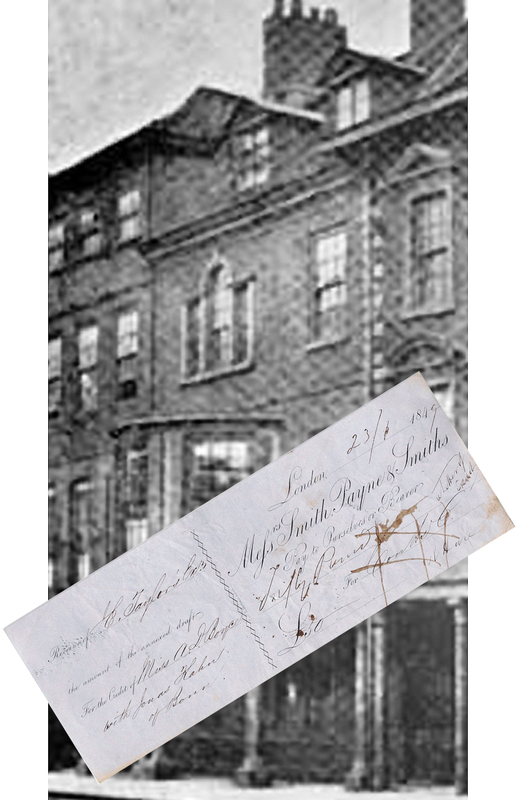 Smith added picture dealing to his activities from about 1809, making modest purchases at first, and slowly building up his contacts in Europe. This was the business his sons and grandsons would carry on, from the 1840s. 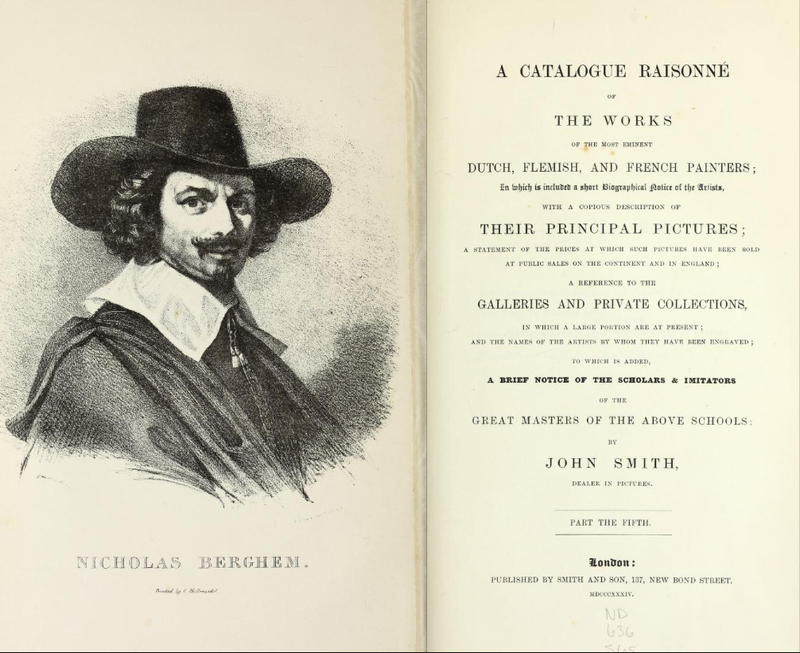 Smith himself is now most remembered for the work which emerged from his picture-dealing: the mammoth nine-volume Catalogue Raisonné of the Works of the Most Eminent Dutch, Flemish, and French Painters…, which was published in parts between 1829 and 1842. The first volume was dedicated to one of Smith’s most illustrious clients, Robert Peel, who became Prime Minister in 1834. Smith’s Day Books are, however, just as absorbing as his more art historical writing. Beautifully written in flowing copperplate they record, month by month, the work done for – as it seems – most of picture-owning England, including Lord Byron and Sir Richard Colt Hoare, the owner of Stourhead in Wiltshire. This work included cleaning and varnishing paintings, repairing frames, and making new frames. 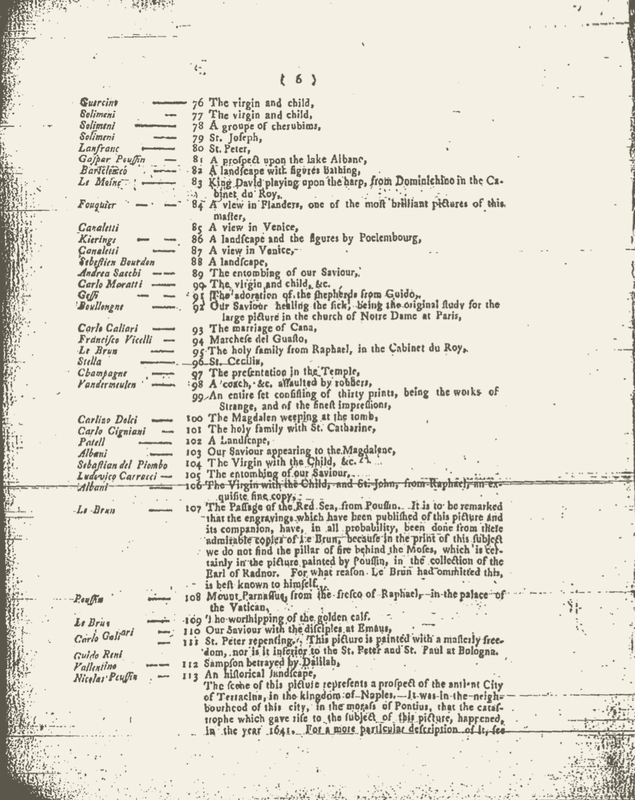 The new frames are described briefly in the Day Books, with tiny profile sketches accompanying the entry in the margin. 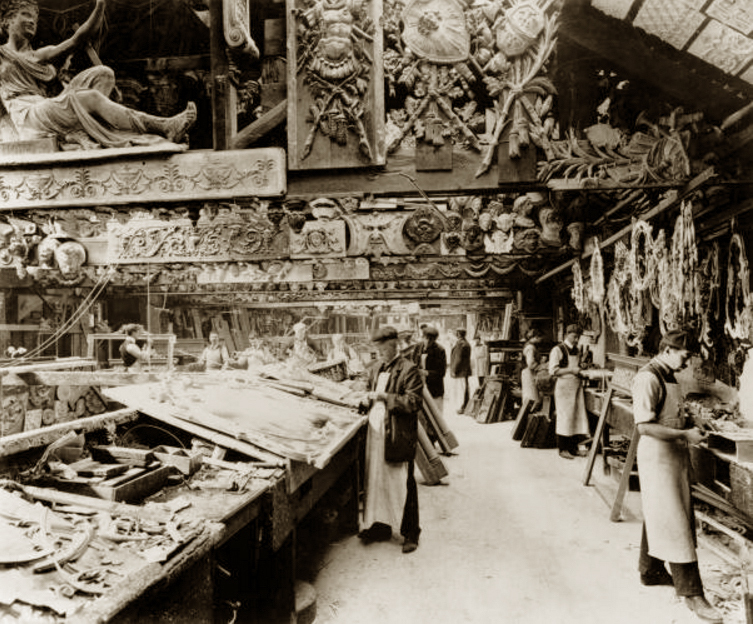 The width of the moulding is given, and the length needed to make the whole frame; corners and centres (or ‘middles’ as Smith calls them) are indicated, and the number of hours spent on the work is meticulously recorded. Fascinatingly, we also find that Smith notes when his workshop uses bought-in composition ornaments from other framemakers and suppliers, such as ‘Rs french corners and middles’. Jacob Simon has found other references which give the whole name of the source, such as ‘Jacksons rich shell moulding’ and ‘Jacksons egg’, which must refer to the famous supplier of composition ornament, George Jackson. 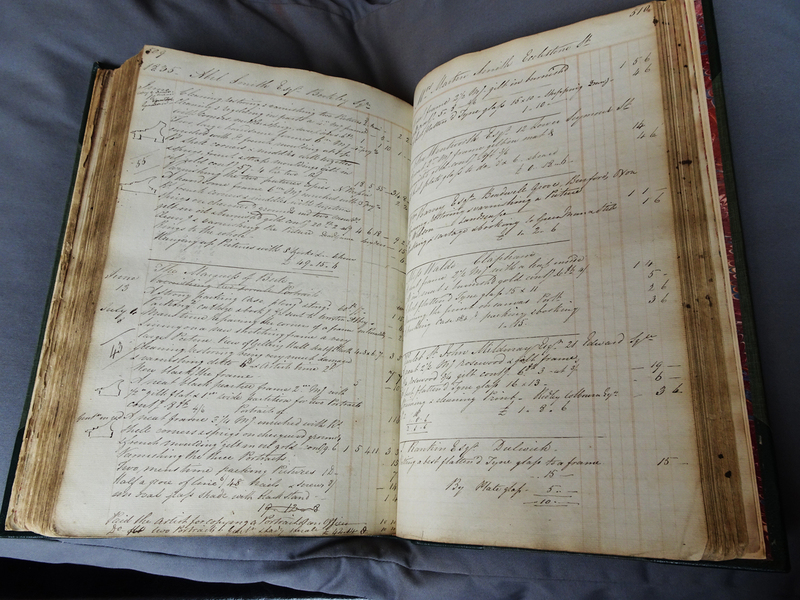 The Day Books run from 1812, when Smith was given his Royal appointment, and, including other records, encompass the whole of the 19th century. To track down the frame on the possible Charles Le Brun painting, it only seemed necessary to look at one volume of the Day Books, since the change of address reference on the framemaker’s label had narrowed down the time the frame was made to 1829 or the next year or so. However, there was no indication as to who had bought the frame from Smith. 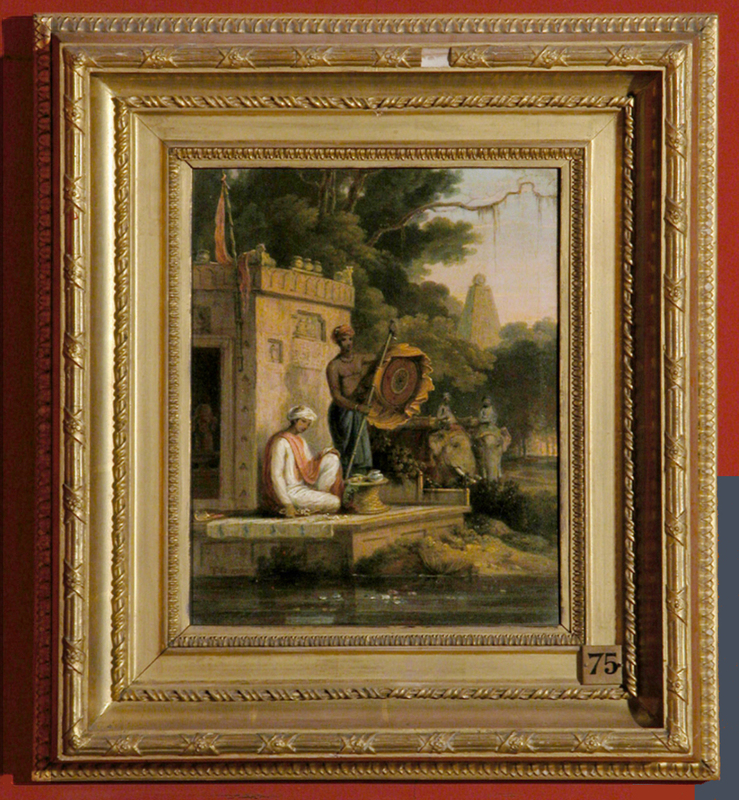 The copy of The crossing of the Red Sea and its pendant, which had been sold in 1773, had been bought by a man called Parsons, according to the annotations in the sale catalogue; but whether Parsons was a collector or a dealer, and whether he still owned both pictures in the 1820s and 30s, were moot points. The Day Book started in 1827, but it was not until halfway through the entries for 1835 that a needle fell out of the haystack – a single line in half a page of items. ‘Varnishing the two pictures copies N. Poussin’ it read, for an Abel Smith Esq of Berkley Square. In other words, these frames were made from a 6 inch wide moulding, which projects 4 inches from the wall at the deepest point. 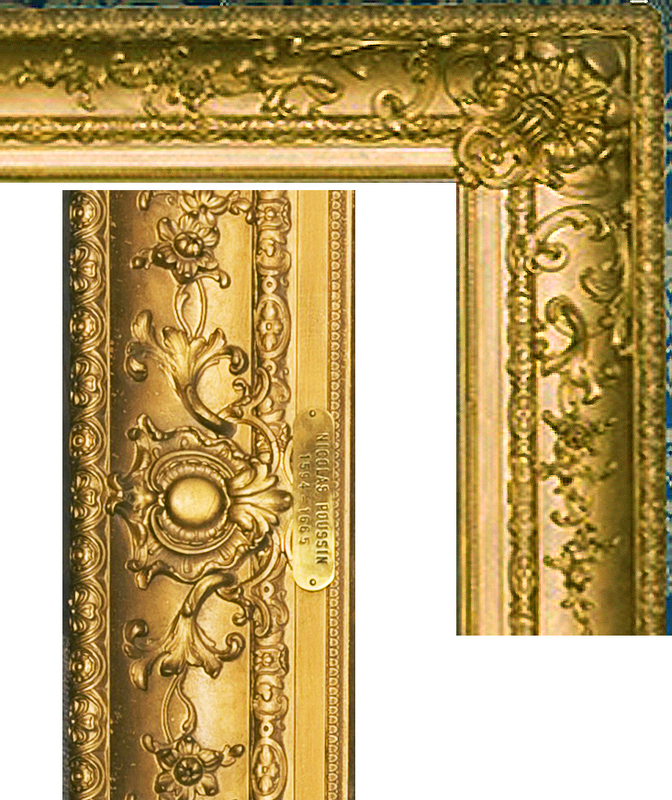 They had ‘J’s french moulding’ on the top edge (which is the outer contour of the frame, decorated on the Le Brun with a chain pattern enriched with flowers), and they had ‘R’s shell corners …[with] sprigs’ – all of which fitted with the Le Brun frame. 57 feet 4 inches or 1717 cm of moulding had been used for both frames – and this is exactly twice the measurement around the frame of the Californian copy of Crossing of the Red Sea (74 x 95 inches, plus an extra foot for safety). This was the only entry in the book which fitted all the requirements of size, date, and painting attribution, and it seemed certain that this must be the frame of the painting ascribed to Le Brun, together with the copy of its pendant, The worshipping of the golden calf, which had been sold with it in 1773. This left the question, who was Abel Smith, the client who was paying for the frames? He turned out to be another interesting figure, from a second dynasty of Smiths – one of Britain’s great banking families. The Smith bank had been founded in Nottingham in the 17th century – the first English bank outside London – and it had flourished, setting up further local branches, and eventually creating a headquarters in London. The Smith family had many descendants, a lot of whom were confusingly called Abel, worked for the bank and also became MPs. There were so many Abel Smiths, in fact, that the family has now adopted it instead of plain ‘Smith’ as their surname, so they are now all Abel Smiths. The one who is of interest here was born in 1788, became head of the bank and an MP, dying in 1859. 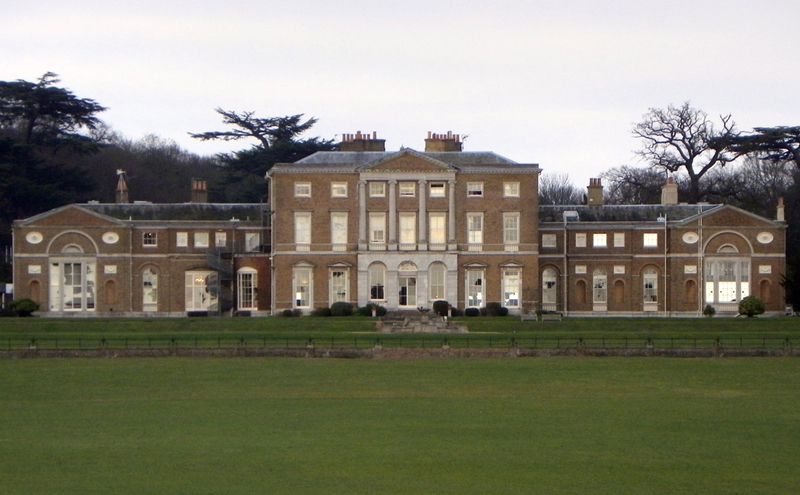 His father was a Samuel Smith, who had bought Woodhall Park in Hertfordshire with all its contents in 1801, and who died in 1834. 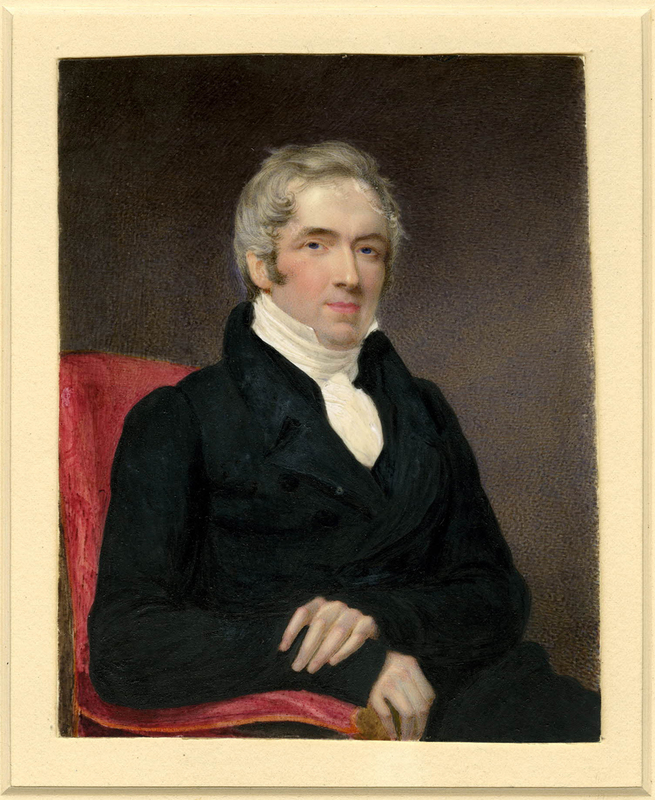 This meant that Abel Smith, Samuel’s eldest son, inherited Woodhall Park that same year, 1834 – immediately before he gave two large orders to John Smith the framemaker, to clean and varnish paintings, and repair, regild, or make new frames. In June and July 1835 Abel had ten paintings cleaned and varnished, seven frames repaired and regilt, and three new frames made, including the two for the Poussin copies. This signalled his taking over the family mansion and its quite impressive art collection, which included works by Murillo, Stubbs, Salvator Rosa, Rubens and Caravaggio. He also inherited the London house, 39 Berkeley Square – hence the address in John Smith’s Day Book; here he would have lived next to the Countess of Jersey, heiress to another banking firm – Child and Co. The Abel Smith family continues to live on the Woodhall Park estate until this day, but now it has settled in the stable block. 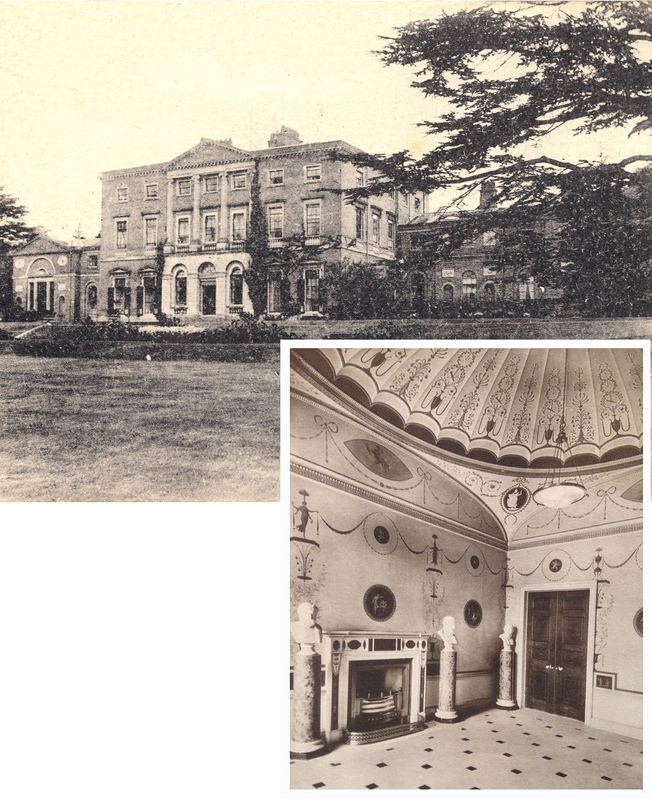 In 1931, after the death of Colonel Henry Abel Smith, there was a sale of the contents of the house, and it was adapted to be used as a school which is still there. Six year before this sale, in 1925, two articles on the house and its garden and interiors were published in the magazine Country Life; and while neither has a photo showing the Poussin copy in situ, in one room a still life can be seen, the frame of which is similar to the John Smith frame on The crossing of the Red Sea. 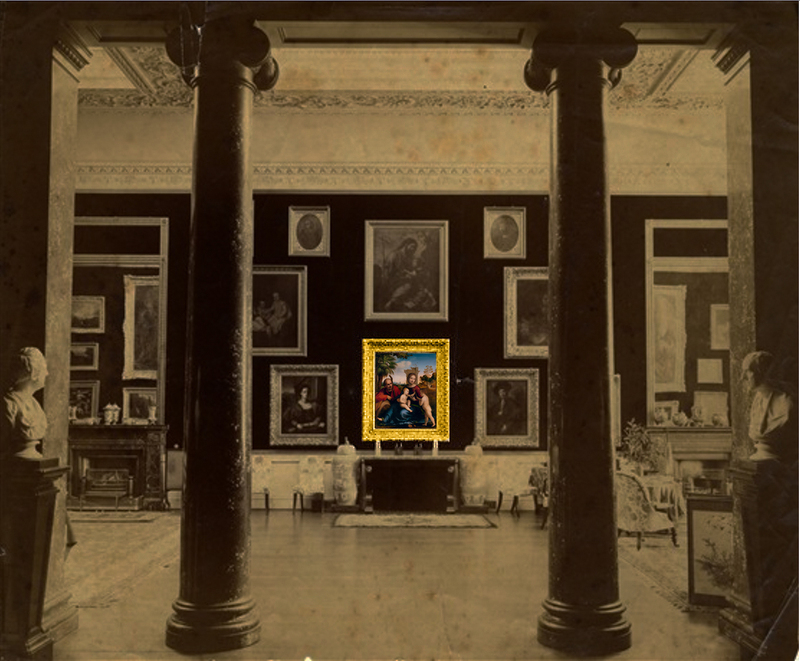 It may be the painting of ‘Dead game by Snyders’ which Abel Smith had framed by John Smith at the same time that he bought the two frames for his Poussin copies. 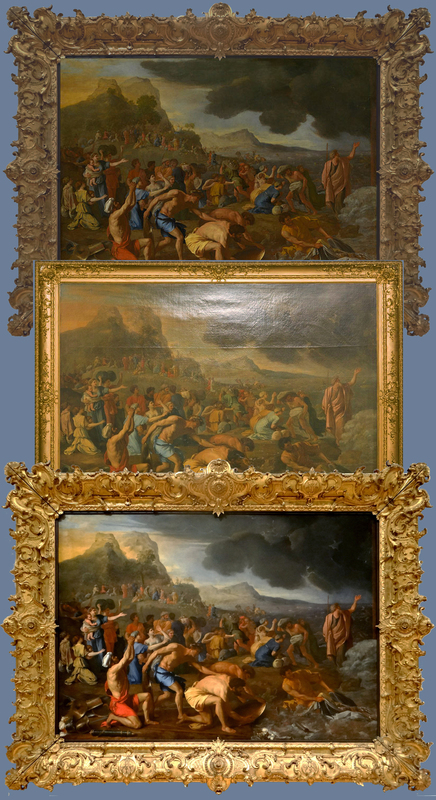 Some time before the sale at Woodhall Park, both copies had been reattributed to Poussin himself, and gilt tablets to that effect fixed to the frames, as can be seen on The crossing of the Red Sea – an indication that frames can carry all sorts of information about the paintings they contain, including exaggerations and downright fibs. 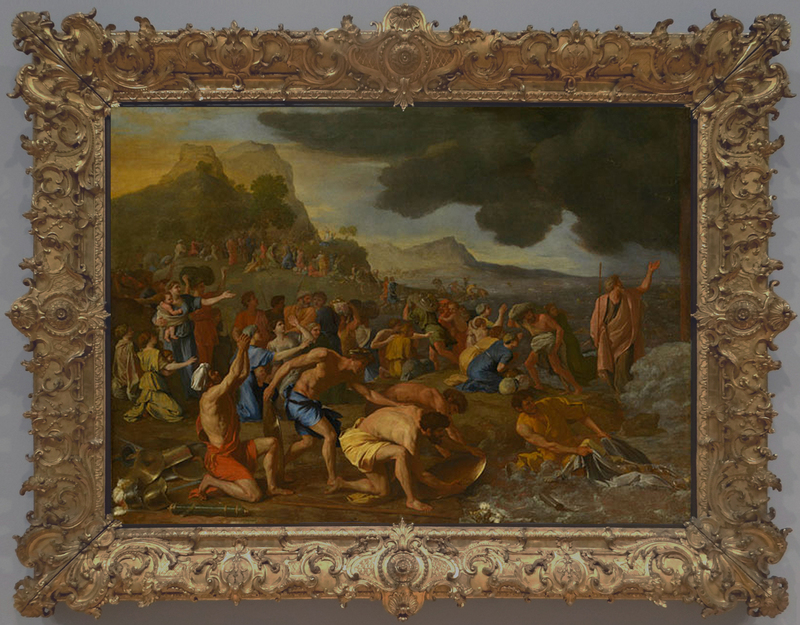 This reattribution meant that in the 1931 sale at Sotheby’s, both paintings were described as being by Poussin. They were bought by someone called Fricke (not, unfortunately, anything to do with the Frick Collection), at which point they disappeared into the art market, and became separated. In the 1960s The crossing of the Red Sea was bought in a sale in San Francisco by the parents of the present owners, and remained in their house until 2008. Its emergence as a potential Le Brun, copied from the original Poussin, enabled it to be used in the restoration of that original, here in Melbourne – helped to prominence partly through the framemaker’s label on the back. If there is a moral in this story, perhaps it can be couched as a plea to all museums, institutions, commercial galleries and private collectors not to cover up, remove without recording or otherwise endanger the fragile pieces of information that a frame may offer. 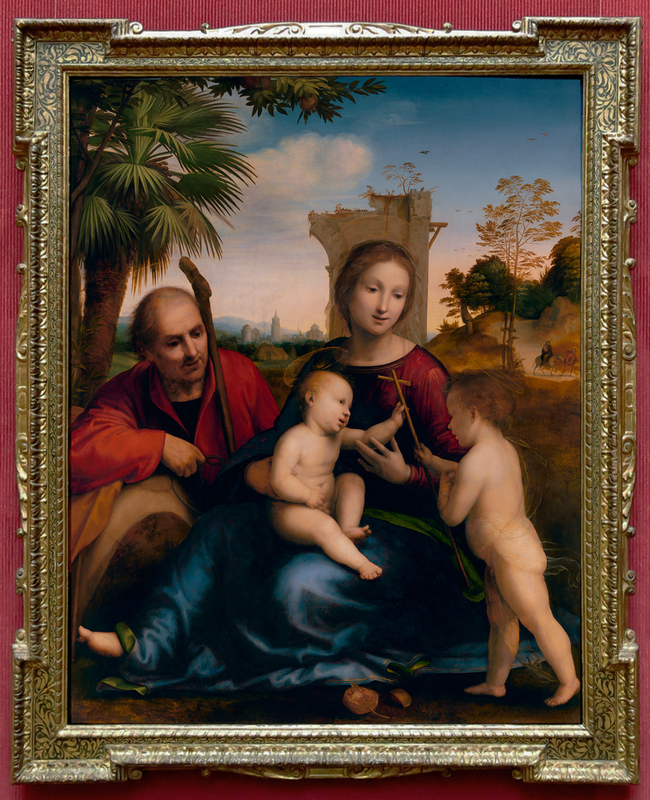 A shorter and even more vivid example is that of a Fra Bartolomeo, The rest on the flight into Egypt, which was acquired in the late 18th century by the 3rd Earl Cowper, and came by descent to hang in the picture gallery at Panshanger, Hertfordshire, before the house was demolished in 1953. The painting had been reframed in the 19th century, in a revival French Baroque giltwood frame, to fit in with other works in the gallery. When it was bought by the Getty in 1996, the curators wanted to present it in a frame more fitting to its nationality, period and aesthetic, and inquired of contemporary antique frame dealers. One of them had, he thought, exactly the right type of frame – a slender 16th century cassetta with outset corners and beautifully-executed sgraffito decoration on the frieze. This frame, which was in London, was tried on a life-size image of the painting in the curator’s presence, who approved it, and – as no adjustment of size was needed – the frame dealer personally accompanied the frame (as it was rare and precious) out to Los Angeles. Everyone involved in the acquisition of this new setting gathered in the framing department, where the frame was placed face down on a table, and the painted panel slid into it. 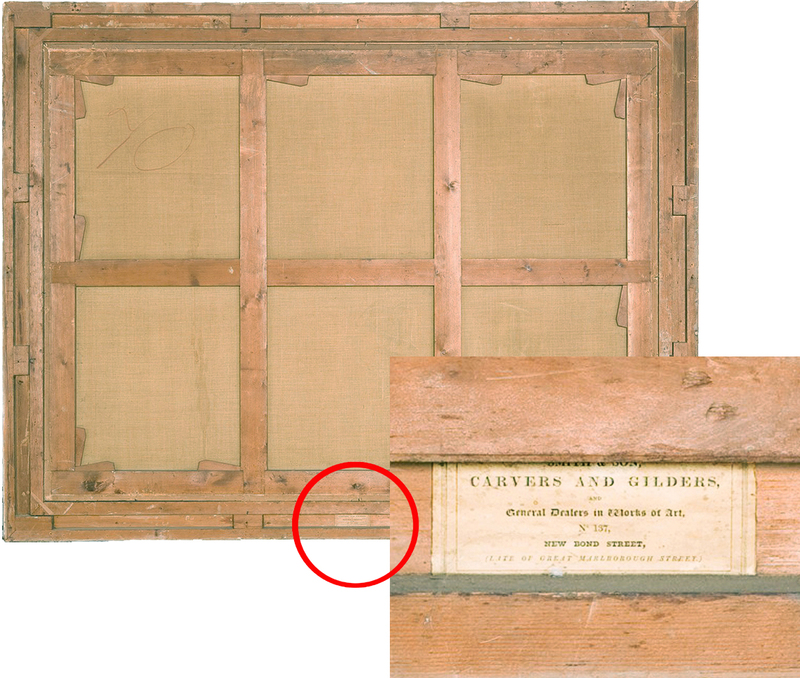 It could then be seen that there was a half an old label fixed onto the back of the frame, which corresponded to half a label on the back of the panel. The picture had found the frame it had occupied before the Panshanger reframing. With thanks to Ralph McLeran, Ralph Abel Smith, Louise Bradley and Holly McGowan-Jackson. The painting attributed to Charles Le Brun is still looking for a permanent home where its fascinating history can be appreciated. Such interesting details and connections in this investigation. I am anxiously looking forward to the conference in a few weeks. See you then! Such scholarship — it is a fascinating world you live in. And what an amazing story about the Bartolommeo. It’s certainly an extremely interesting world – less well-known than that of the paintings, of course, and therefore more open to discoveries of various kinds. I’m glad that you enjoyed the stories; I’m sure that there are many more like that out there… (have you read this? -https://theframeblog.com/2013/12/19/the-miracle-of-cortemaggiore-a-500-year-old-frame-returns-home/ ). Wow, so miracles do happen from time to time.